Happy Seventh Day of the Lunar New Year! Today is what we call 人日 (rén rì) or Man’s Birthday: everybody’s birthday! A strip of gold across a field of blue flowers, surrealist-style. Although not very surrealistic, this picture. 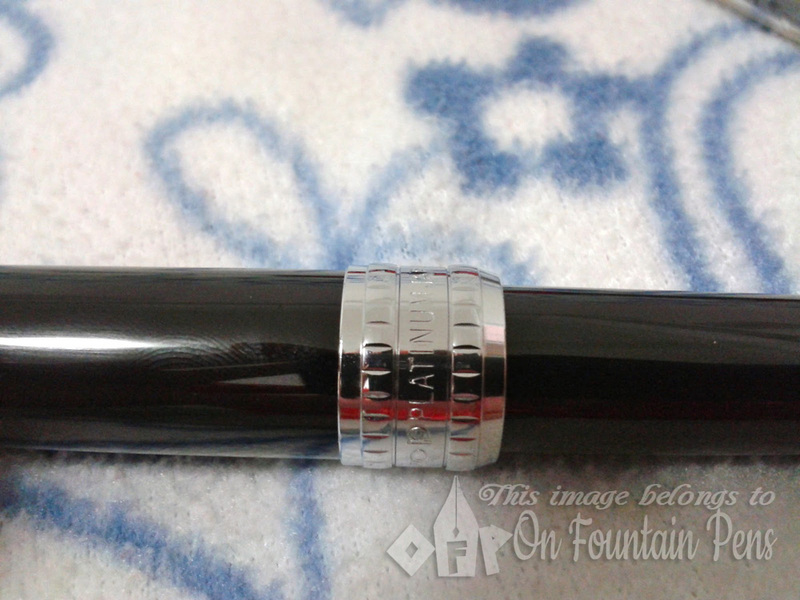 Long due is the review of one of my favourite pens: the Platinum Plaisir. 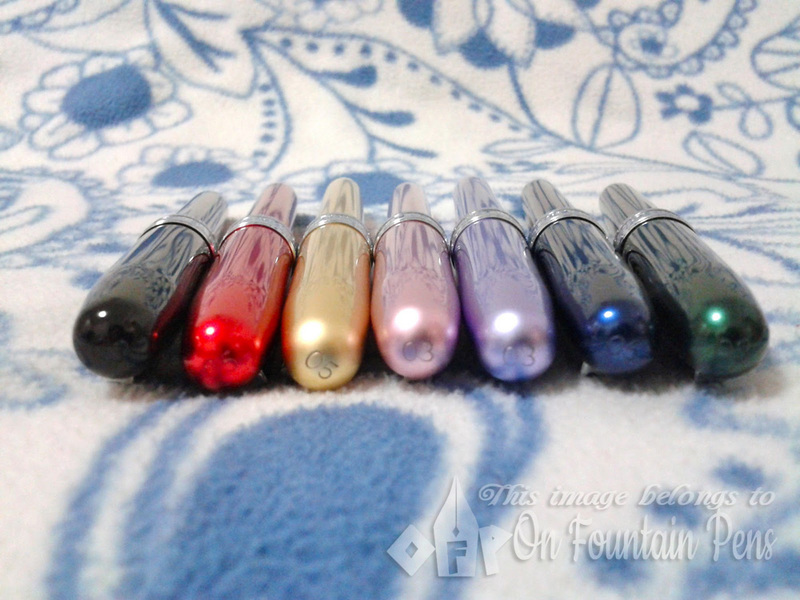 I will do a mini comparison with the Platinum Preppy because I believe almost everyone knows about the Preppy already, if you are a fountain pen-phile. For the sake of those who had never heard or thought about fountain pens before, I will write a small paragraph on the Preppy. So far I have only come into contact with two Platinum pens, namely the Plaisir and the Preppy (which will be thus referred to in the rest of the blog). The Preppy: a really cheap and good starter’s pen, it is made of see-through plastic which is pretty appealing if you like demonstrator pens (basically, see-through pens). It’s lightweight and has a steel nib section coated with the colour of the pen itself. So if you have a pink Preppy, it comes with a pink-coated nib section. A special thing about this pen is the capping mechanism: there is somewhat like a double-seal mechanism, one at the normal place where the cap clicks onto the pen, and another within the cap itself, which seals off air from the nib section. 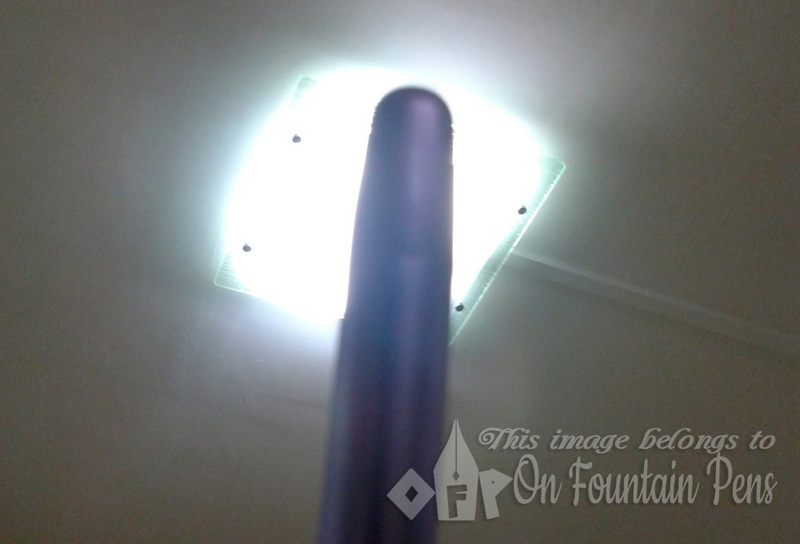 The inner cap part is supported by a spring to press it against the nib section to ensure it’s sealed. Apparently this is to prevent the nib from drying out, so that the pen can restart immediately after a long period of disuse. It holds true so far, although my very wet pink Preppy (it says 0.3 nib but writes more than a 0.5) had a minor drying out problem. I had to make one stroke on paper before the ink started out again after 6 months of lying in a drawer. 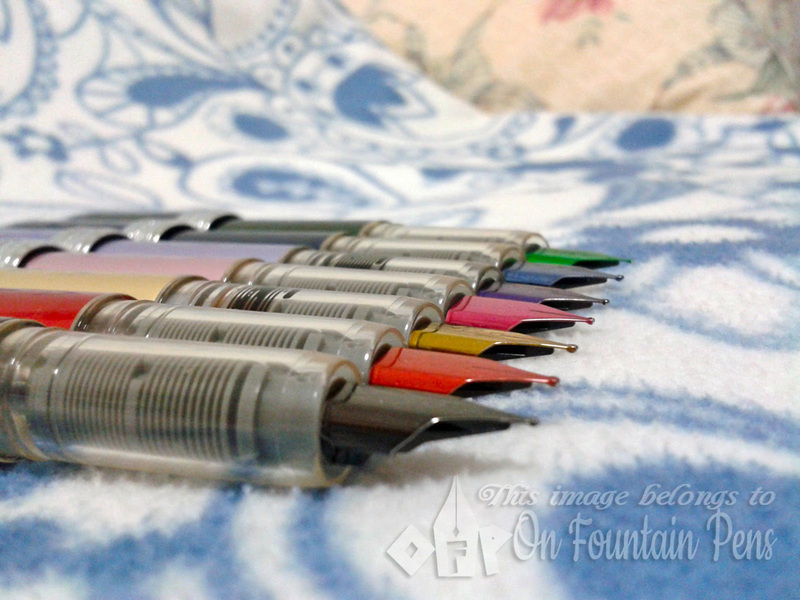 At 13.8 cm capped and 15.4 cm posted, this pen is worth more than the super low price of 4 SGD. Oh look at how sleek it is! Shush, it’s sleeping sleekly on my blanket! Although some people complain about the price, I think the appearance of the pen looks more expensive than its 19+ SGD which I bought for at Kinokuniya Ngee Ann City (it’s on a cardboard stand on the fountain pen counter near the stationery section). When I say 19+ SGD I mean something like 19.70 SGD. Can’t remember the exact amount of cents but it should be right. I took a really long time to choose a colour and finally decided on the last PURPLE on the stand, oh such a beautiful colour. It irritated my fountain pen buddy who was with me at that time, and under peer pressure from me, she also got a green Plaisir. It was really sinful of me because after a few weeks with the beautiful colours on my mind, I went back to the bookstore to get the remaining SIX colours. So now I have SEVEN Platinum Plaisirs in my collection! These pens simply scream out ELEGANCE at me. I am deafened. Made of aluminium anodized with the pretty colours, they look shiny and seem eternally scratch-proof and tarnish-proof, although I haven’t owned one for long enough to test this quality. If there is a smooth glossy equivalent of the matte Parker Urban‘s surface, it has to be the Plaisir. Somehow the body and the colours remind me of car surfaces. Don’t you agree? Agree? You have to agree! The nib size is carved almost unnoticeably on the top of the pen cap. Being too mesmerized by the appearance (yes superficial me), I totally overlooked the fact that these pens come in two different nib sizes, 0.3 and 0.5. But it didn’t really matter to me, as long as these pens are good writers. When I went back to get the rest of the colours I decided to just grab at random different sized nibs. 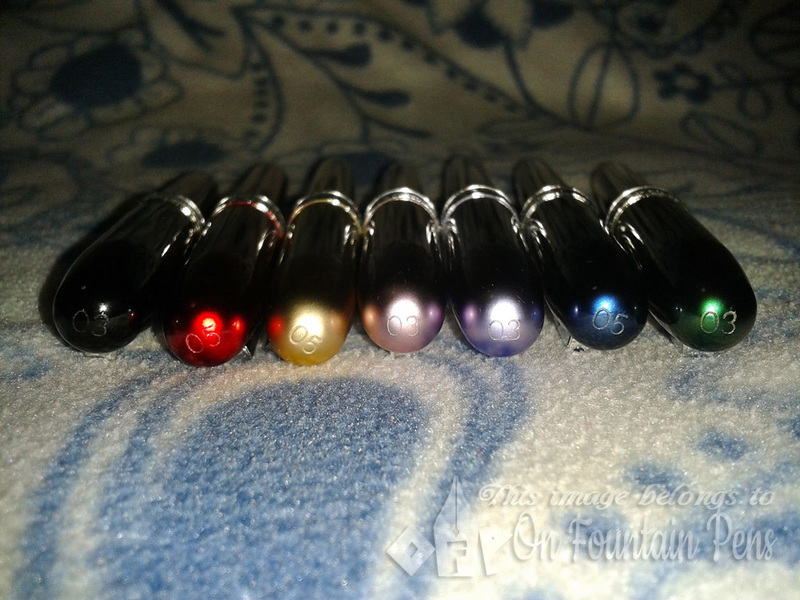 So I got a 0.3 black, 0.5 red, 0.5 gold, 0.3 pink, 0.3 purple (previously bought also at random), 0.5 blue and 0.5 green. I had only been willing to ink the original purple pen and keep the rest for viewing pleasure during my times of private self-admiration and imaginings that I am a fine writer who curls beautiful scripts on good parchments (the opposite is true in reality), but for the purpose of the writing sample as shown in the second pic of this blog post, I inked the gold pen with a cartridge of Platinum brown ink. It is obvious to me that there is NO difference in the line thickness despite the black (from my purple Platinum) is supposed to be 0.3 while the brown (gold Platinum) is supposed to be 0.5. However I can feel that the nib is fatter on the gold pen which gave me the impression that more ink was flowing from the nib, giving a fatter line. It’s an ILLUSION. 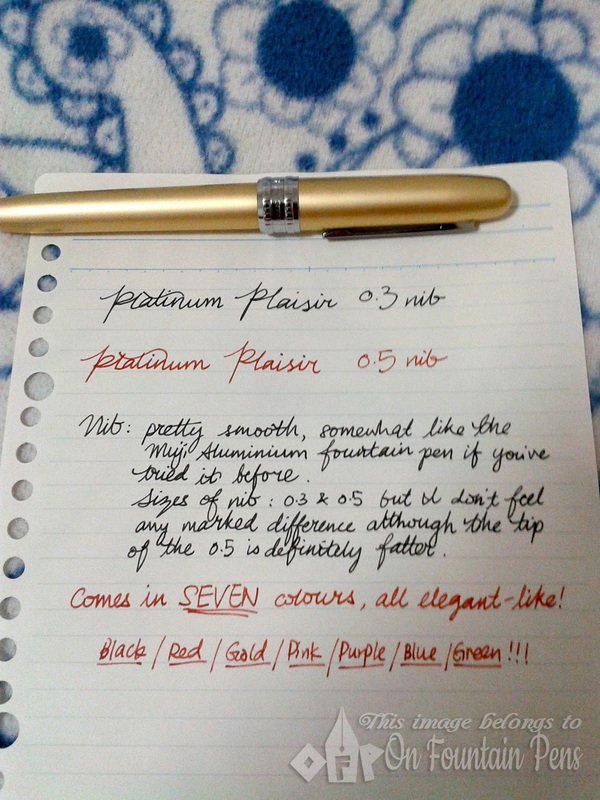 Maybe, like Lamy nibs on the Safari range, Platinum nibs from the Plaisir range isn’t consistently produced. As I mentioned above, the 0.3 pink Preppy that I use gives a line thickness that seems more like a 0.5 or more. I am currently not willing to experiment with the nibs of the other coloured pens though. they are meant to destroy. Muahahaha. 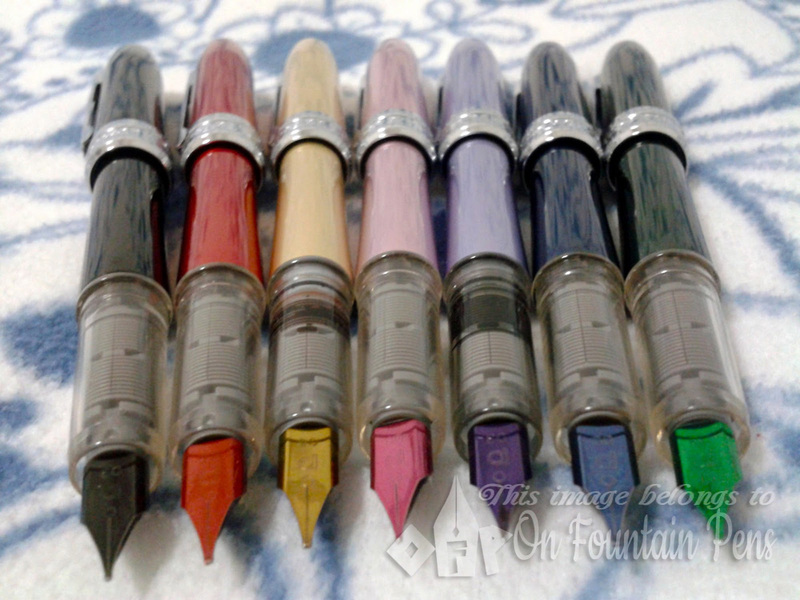 The picture on the left shows the colours of the pens posted, featuring the corresponding colours of the nib sections! Honestly, the nib section of the Plaisir (and Preppy) is not fantastic, they look somewhat angular and are very underdesigned; no engravings whatsoever. But with a touch of colour they look a little better in my opinion. The downside: the colours start to tarnish if the pen is inked, and when the ink stains the nib section. Also, I had tried to wash out the section of a Preppy I used to own, but ended up scratching off most of the paint, making the poor Preppy look like some poor scarred thing. And now for the mini comparison. I would say the Plaisir is a higher-end version of the Preppy, in terms of looks, cost and durability, because I have read somewhere that the plastic Preppy sometimes cracks. If made of aluminium it’s almost sure to last at least twice as long as a plastic Preppy. Although, despite what some articles seem to imply, the Plaisir is not damage-proof, as my purple Plaisir was found to have a dent on it after I took it home. 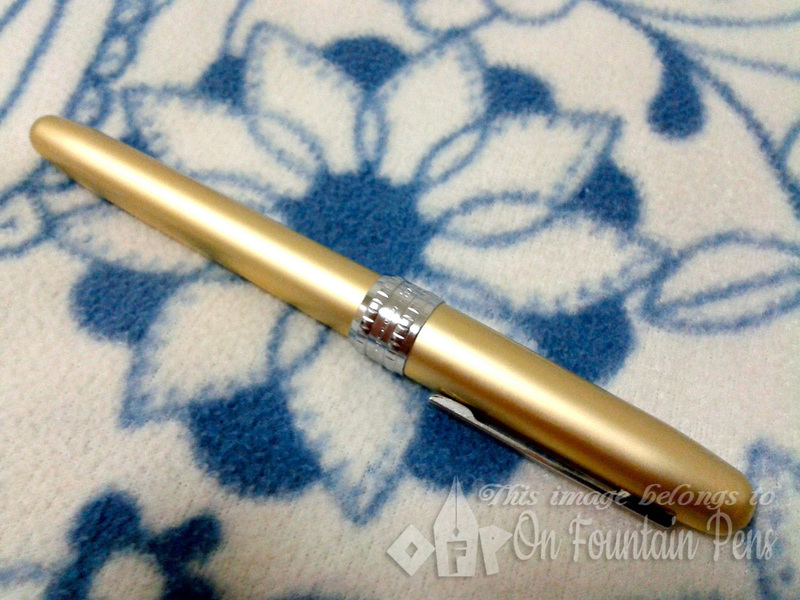 However the Preppy has the brand and all the Japanese whatsits printed all over the plastic body, making it look like a pen that costs… well, its price of 4 SGD. It definitely isn’t a cheap pen that you would be proud of carrying in your pocket or purse. At least the Plaisir is a pleasure to carry around. Other than the barrels and caps, they pretty much look indistinguishable. So I decided to exchange parts and screw and cap them back. And the result: perfect fit! Even the caps could be exchanged. Although they are very much less aesthetically-pleasing in such a state. 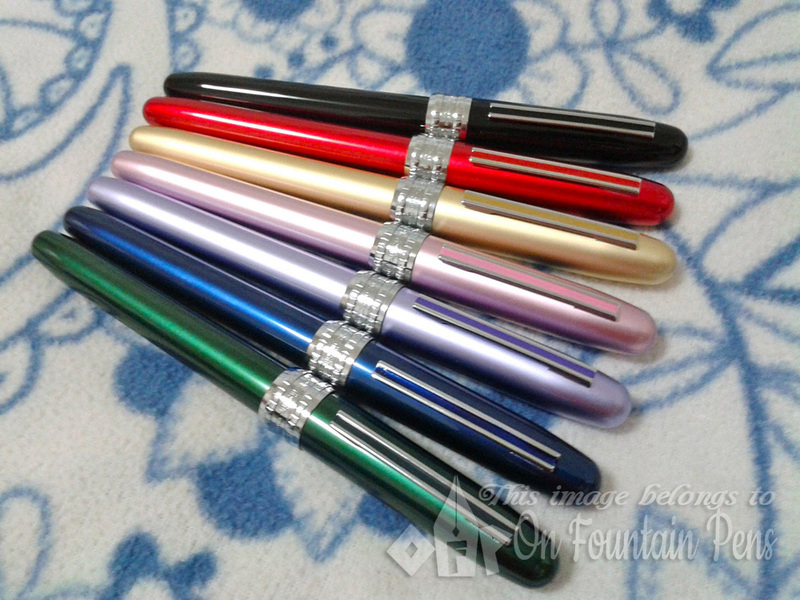 So in conclusion, both the Plaisir and the Preppy are good writers, and if you are a starter on fountain pens and don’t want to invest more than 20 SGD on a nice functional pen, the Platinum Plaisir is the way to go. And if you’re really broke, there is still a 4 SGD Preppy at your disposal. I might just mention that both use Platinum cartridges which come in various ink colours like blue, green, black, brown, pink, etc., and they can be found at Kinokuniya at about $1.40 for a two-in-a-pack or at Daiso (if you’re lucky) at $2 for a three-in-a-pack. When you say feed, are you suggesting the grey finned section can be removed as well? I was wondering because it has built up ink In it, and I would like to remove it from my plaisir and clean it, but don’t know if it is forceable etc.